When it comes to countertop pressure cooking, the Instant Pot cannot be beaten. Besides pressure cooking, they include a variety of cooking functions, making them incredibly versatile in cooking nutritious and healthy food. The Instant Pot lineup of multi-cookers includes eight different current models (without counting LUX v2). Selecting the right one is a challenge as they often include many of the same features. Before choosing one of these appliances, you should compare their features. To help you out, here is a closer look at what you get with each option. The Instant Pot LUX 60 (V3) is the newest version of one of the original Instant Pot models. The LUX was the second Instant Pot and is now considered the budget option. It is the most affordable model and contains the fewest features from the rest. The original Instant Pot LUX 60 is a 6-in-1 multi cooker. It can slow cook, pressure cook, make rice, steam, sauté, and keep warm. All other Instant Pots contain at least these six functions on top of any other features that they provide. The V3 is the latest version of the Instant Pot LUX and includes the third-generation microprocessor. This newer microprocessor increases the maximum cooking time to 240 minutes and the delay start to 24 hours. Besides increasing the cooking time and delay start, the V3 adds the cake and egg cooking functions, making it an 8-in-1 cooker. These options were previously only available in the higher-end models. The display panel is also larger compared to the previous LUX mode, making it easier to view the current settings. The Instant Pot DUO 60 is the most popular model. It was released after the original Instant Pot LUX and added the yogurt function, making it a 7-in-1 multi cooker. Here are the main features. Besides the addition of the yogurt function, several other changes were made for this model. The DUO includes two different pressure settings – high and low. The design of the DUO also allows you to hang the lid on the side of the pot instead of placing it on your counter. With the DUO, Instant Pot also started to increase the number of smart programs added to the Instant Pots. The smart programs are preset settings for the base cooking functions. You can choose from soup/broth, bean/chili, meat/stew, sauté/simmer, rice, porridge, steam, slow cook, and more. The Instant Pot DUO 60 is a step up from the LUX. Both options take up about the same amount of space but the Instant Pot DUO adds more smart programs and the yogurt function. Heat indicates heating and cooking are in progress. Pressure Cook indicates the Pressure Cook option has been selected. Keep Warm advises your Instant Pot is still on and food is warm. With the Instant Pot Nova Plus, you get an updated display that looks very similar to the display on the DUO Plus. In fact, the Nova Plus is basically the same product as the DUO Plus with the cooking functions of the regular DUO. The updated display is larger and easier to read. It is also surrounded by additional smart buttons and cooking functions. You get 14 one-touch smart programs, which is two more than the DUO. The main update is a new display. The LCD screen is larger compared to the DUO. It also includes more smart programs. You get 15 different smart programs and several new cooking functions. These new options include egg, cake, and sterilize. The sterilize feature allows you to sterilize utensils, baby bottles, and other items. With the third-generation microprocessor used in the latest Instant Pots, these options are now available in most models. The design is closest to the popular Instant Pot DUO. It includes the same display with a couple of extra functions. With the Instant Pot VIVA 60, you get the seven cooking functions offered with the Instant Pot DUO. The added functions include preset options for cooking eggs and cakes. You get 15 different smart programs with the Instant Pot VIVA 60. These are the same smart programs found on the Instant Pot DUO. 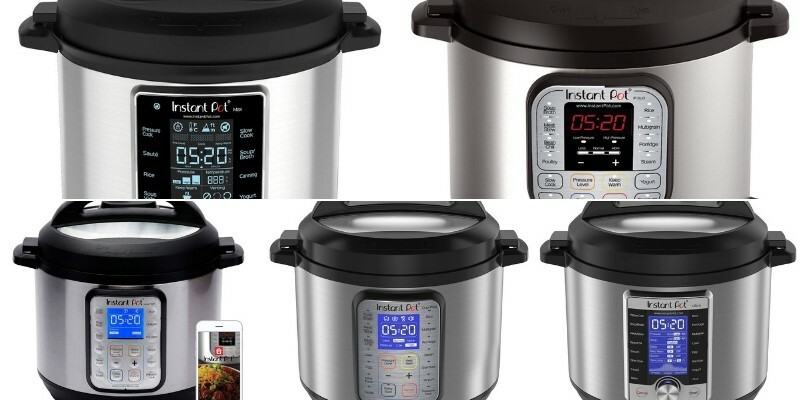 It includes the main cooking functions created for the Instant Pot lineup of products including slow cook, pressure cook, rice, warm, sauté, porridge, yogurt, and multi-grain. The biggest update is the creation of a new custom cooking mode. The ULTRA mode allows you to set the pressure level, cooking time, delay timer, and keep warm setting. You can also set the temperature. With the ULTRA mode, you can choose any temperature between 104 and 208 degrees Fahrenheit. The pot can even store your custom settings. Another update is the new display panel. The Instant Pot ULTRA 60 removed the large buttons and replaced them with a spin dial. The spin dial is used for selecting cooking programs and adjusting the temperature. The ULTRA also adds an altitude adjustment. If you live in a region with a high altitude, this adjustment feature makes it easier to follow recipes. The Instant Pot Smart WiFi includes the standard cooking functions and smart programs. You get eight different cooking modes and 15 smart programs. However, you also have endless options with the custom scripts. With the Instant Pot Smart WiFi, you can use cooking scripts to use custom settings. The scripts let you specify the cooking temperature, time, delay, and keep warm, similarly to the Instant Pot ULTRA. You can also set multiple cooking sequences. For example, you may pressure cook for a set amount of time, slow cook for a specified amount of time, and then keep warm for a set number of minutes. You can write your own scripts or download them from the Internet. With this feature, the Smart WiFi provides endless cooking functions. The Instant Pot MAX is the only Instant Pot model that allows you to use 15psi for pressure cooking. All previous models had a max pressure level of 11.6psi when using the “high” setting. The 15psi option is called the “MAX” pressure setting and lets you follow stovetop pressure cooking recipes without any modification. With the new pressure setting and the custom settings, this is the most versatile Instant Pot available. This newer Instant Pot also has an automated pressure release. The automated pressure release eliminates the hassle of the manual pressure release. With the manual release, you need to use caution to avoid allowing the steam to scald your skin. With the Instant Pot MAX, you also get a touchscreen display. Instead of pressing buttons that crowd the LCD screen, you simply press buttons. It also includes the spin dial for setting the temperature. In the end, Instant Pot has a wide selection of appliances to suit any kitchen. When comparing these products, remember to focus on the features that they provide. The Instant Pot LUX is the most basic option, providing six different cooking functions. The Instant Pot ULTRA, Smart WiFi, and MAX are the only ones that allow you to set specific cooking temperatures. In out opinion, the best models in the product series are the Instant Pot DUO Plus and ULTRA. The first one is value-for-money while the second one has the best features and best feedback from customers. Think about how you plan to use the cooker and whether you want more control over the settings. No matter which option you choose, you are sure to get a reliable countertop pressure cooker.